During a wide-ranging discussion Jan. 15, 2014, Judy Murphy of the Office of the National Coordinator (ONC) for Health IT in the US Department of Health and Human Services touched on everything from definitions associated with health informatics, the rise of quick care centers in pharmacies, broadband connectivity in rural areas, to patients’ engagement with their own healthcare – and how it all relates to the implementation of electronic health records, quality care, and big data. GW SON Dean Jean Johnson posed a variety of questions to Murphy, the ONC Deputy National Coordinator for Programs & Policy. A nurse, Murphy joined the ONC in December 2011 with more than 25 years of health informatics experience at Aurora Health Care in Wisconsin. In 2007, Murphy was honored as one of "20 People Who Make Healthcare Better" by Health Leaders magazine. The discussion, focused on “Health Information, Big Data & Quality of Care,” was co-hosted by the GW Virginia Science & Technology Campus and the GW School of Nursing. Electronic health records, the implementation of which Murphy and ONC have led and continue to facilitate, are a way to ensure that a patient-centric record follows a patient wherever he or she goes and to provide a tool for patient engagement and improved quality of care. “Everybody is taking accountability,” Murphy said. Providers are participating in health information exchange (HIE) to better share medical information to provide more effective, efficient health care services, according to HealthIT.gov. Healthcare providers, including nurses, pharmacists and specialists, in addition to a patient’s primary care doctor have that accountability, and so do patients. “Patient engagement and the patient-centric record really do go hand-in-hand,” Murphy said. Just as the move from typewriters to computers made it easier for people to change their documents, allowing for a whole new way of editing and subsequently raising the standards of what we expect, the electronic record is doing that for healthcare, she said. Healthcare providers are improving how they work with the electronic tools now available. For example, reminders about necessary tests can be automated, improving patient care and ensuring standards are met, she said. During a question-and-answer period, a GW SON student asked Murphy what role she felt insurance companies played in developing the health information exchanges. The insurance companies have as much of a role as anyone, Murphy said. Integrating payor data – such as what tests and prescriptions have been paid for – in with clinical data will only improve the picture of what healthcare providers know about a patient. Other concerns about security and privacy were raised. Privacy does continue to be the number one concern of patients, Murphy said, although the federal law HIPAA is already in place. In terms of security, there is no one national depository where all health information is stored. While some states have designed their health information exchanges as depositories, others are more like routers, simply facilitating the sharing of information when a query is generated, Murphy said. The Deans' Speaker Series, hosted by Dr. Ali Eskandarian, brings leaders and experts together with students, faculty, alumni, and the community to facilitate discussions on challenges and opportunities of our global society. 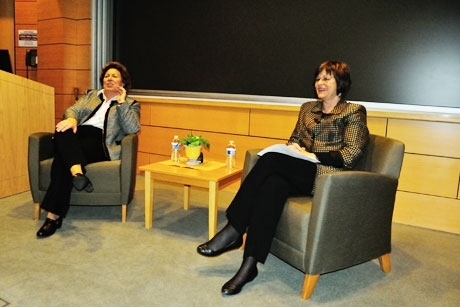 This event was co-hosted with the GW School of Nursing and generously supported in part by Steven and Lori Lerman.